Carbonized petiole of windmill palm (Zonglutan)-Trachycarpus fortunei H. wendl. Botanical Name: Trachycarpus fortunei H. wendl. Part Used & Method for Pharmaceutical Preparations: The palm fiber is gathered in the period of the Winter Solstice (twenty-second solar term), and then it is carbonized. Properties & Taste: Bitter, astringent and neutral. Meridians: Lung, liver and large intestine. 1. Hemorrhages due to extravasation of blood by heat manifested as cough with blood, vomiting with blood, epistaxis, bloody stool and uterine bleeding. 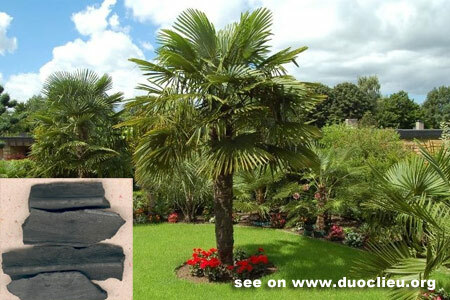 Carbonized petiole of windmill palm (Zonglutan) is used with Imperata rhizome (Baimaogen), Japanese thistle (Daji), Small thistle (Xiaoji) and Capejasmine (Zhizi) in the formula Shihui San. 2. Hemorrhages due to deficiency of yang qi leading to failure of the spleen to control blood manifested as uterine bleeding or bloody stool. Carbonized petiole of windmill palm (Zonglutan) is used with Astragalus root (Huangqi), Ginseng (Renshen) and White atractylodes (Baizhu).